You may be asking what Aretha Franklin has to do with wrestling, and why I'm blogging about her. I learned today that the Queen of Soul is battling pancreatic cancer. It's a disease that has a low survivor rate. She is reportedly doing well after surgery, and I hope she continues to recover. Some "new" fans may not realize that Aretha Franklin is a part of wrestling history. 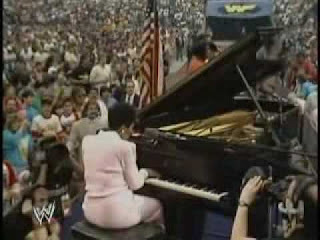 She performed "America the Beautiful" prior to Wrestlemania III. I believe that card still holds the all time attendance record for a Wrestlemania event. While the connection may not sound like much, she was one of many big names who would perform that song prior to a Wrestlemania. It helped kick off the day. The song got fans riled up for the event. In recent years, it seems the quality of those performers has dwindled. Or maybe I'm just not as hip to the music scene as I was in the 1980's. Anyway, my thoughts and prayers go out to Ms. Franklin and her family as she faces this battle. Okay, my long term memory is much better than my short term. Since posting this, it's been posted out that Aretha Franklin also performed at Wrestlemania 23, just a few years ago. Not sure how I managed to screw that one up. she also reprised her role at Mania 23. So even newer fans should possibly know who she is.